Mariah Carey was so consumed with divorce talk Tuesday evening ... she blew off her scheduled taped performance for the Rockefeller Center tree lighting ceremony ... and when she finally showed up the pissed off NBC honchos sent her packing. Carey was supposed to tape a segment for the live show that airs Wednesday night. 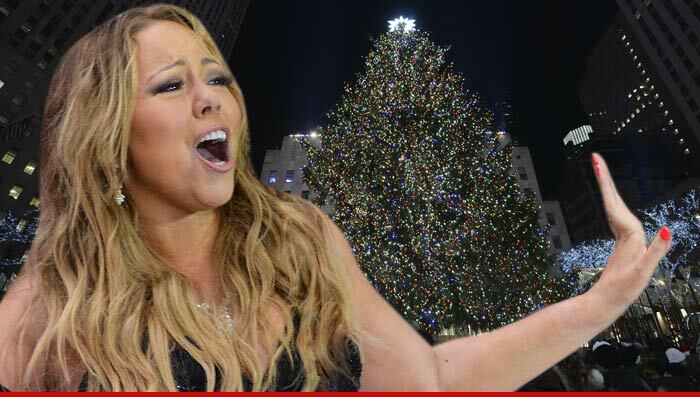 But as fans waited for hours in the rainy, cold night , there was no Mariah in sight. People connected to the hotel tell us ... Mariah was ensconced in her East Side hotel, yacking with her lawyer on the phone about her divorce. People who overheard her say it did not seem nasty ... she was going over the property settlement. When she pulled up to Rockefeller Center more than 3 hours late, she was still on the phone and people overheard her continuing to talk divorce. NBC execs were full on enraged -- ditto the crew -- and Mariah's people were told to just go home. We're told she really wanted to perform, but the network had clearly had enough. We're told Mariah was upset because she didn't want to disappoint her fans or the network. Calls to Mariah's rep were not returned.